Ellen Linda "Ella" (Younkin) Hauger was born on New Year’s Day 1878 near Rockwood, in Black Township, Somerset County, PA, the daughter of William "Shedrick" and Caroline (Cupp) Younkin. 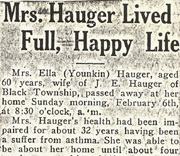 On Oct. 23, 1898, at the home of her parents, the 20-year-old Ella married 29-year-old Jonathan E. Hauger (June 22, 1869-1954), the son of Simon and Elizabeth (Berkley) Hauger, also of Black Township. Because she legally was underage, her parents both had to sign a certificate of consent in the Orphans Court of Somerset County. The Haugers produced three daughters – Olive Caroline Younkin, Grace Ruby Eagle and Edna Elizabeth Sembower. As an infant, Jonathan was carried as a "babe in arms" into the Church of the Brethren in Rockwood, which his grandfather Simon Hauger Sr. had helped found in the mid-29th century. He attended the church until marrying and moving away, only to return later in life. He eventually was considered the oldest deacon in the congregation. The couple settled on her parents' farm in Black Township, where they remained for many years. They are believed to have constructed a new house or other buildings on their property in June 1902, when an article in the Meyersdale Republican noted that "Rockwood is enjoying an unprecedented building boom this year. Already ground has been broken or building is in the course of construction by the following citizens: Jonathan Hauger...."
In 1913, some of the family attended the first annual Minerd Reunion at nearby Ohiopyle, Fayette County, PA. A rare group photograph taken that day has been found in the collection of a descendant, and Ella’s parents and daughter Olive are visible in the image. Click here to view the image in high resolution, with each face numbered for identification purposes. When the federal census enumeration was made in 1920, the Haugers lived next door to their married daughter Olive in Black Township. Jonathan's occupation was recorded as "Farmer - own farm." In addition to farming, Jonathan earned a living as a saw miller and a day laborer. Circa 1924, they operated a grocery store in Rockwood which they maintained for many years near the Western Maryland Railroad depot. Ellen was a member of the Rockwood Church of the Brethren. The Haugers' lives were relatively quiet, and they rarely made news in the local newspapers. There were a few exceptions, and an October 1925 edition of the Meyersdale Republican noted that Jonathan had "purchased a fine bay horse." Then in November 1927, the Republican reported that Jonathan was "cutting the timber on his farm this winter" and that "Harvey Livengood and Clyde Grove are making saw logs for J.E. Hauger." In the early 1930s, the Haugers were devastated when their barn was hit by lightning and burned to the ground. In October 1934, Ella is believed to have been interviewed for an extensive genealogy research effort undertaken by distant cousins Otto Roosevelt Younkin and Charles Arthur Younkin. The men were gathering data in connection with the Younkin clan's new national home-coming reunion, held in nearby Kingwood, which drew more than 1,000 people a year during the heart of the Great Depression. Click here to see Otto Younkin's actual handwritten notes from the alleged conversation with Ella. Ellen suffered for years from asthma and, during the first week of February 1938 was stricken with congestive heart failure. Sadly, she was unable to rally and died at home at age 60 on Feb. 8, 1938. An obituary appeared in a Somerset newspaper, stating that she had succumbed from of an “extended illness” and that she had lived a "full, happy life." The news of her passing was reported in the Younkin Family News Bulletin (April 30, 1938). She was buried at the Rockwood Odd Fellows Cemetery. Jonathan survived as a widower for 16 years. He is known to have attended an August 1952 spaghetti dinner and corn roast held at the fire pit of his son in law William Eagle. During those years, he developed hardening of the arteries. When his circulatory system began to collapse in September 1954, his health declined rapidly. He entered eternity on Oct. 15, 1954 at the age of 85. He was laid to rest beside his wife in Rockwood IOOF Cemetery. In 1957, he was remembered in the commemorative booklet celebrating the town's 100th birthday, Rockwood Centennial: 1857-1957. His son-in-law Maynard Sembower is pictured and named in the same publication. Daughter Olive Hauger (1899-1961) was born on April 9, 1899 in Black Township. At the time of marriage, Clark lived in Rockwood and supported himself as a laborer. The couple dwelled for decades near Ella's parents and grandparents in Black Township on the outskirts of Rockwood. They produced one daughter, Ellouise Theo Kreger. When the federal census enumeration was made in 1920, Clark's occupation was listed as a coal miner. He is known to have labored at the No. 10 and 11 mines near Rockwood. By 1930, he was promoted to coal mine foreman. Perhaps put out of coal mining work by the iron grip of the Great Depression, Clark began working in the 1930s as a pipe fitter for the Rockwood Water Company, and he spent 28 years in this occupation. He also was a school director of Black Township for three decades, including a term as president circa 1949, and was a longtime officer of the Rockwood Volunteer Fire Company. Olive was a charter member of the Rockwood Volunteer Fireman’s Auxiliary. Enjoying social events, the Younkins are known in August 1929 to have attended a wiener and marshmallow roast "in Russell Pletcher's beautiful orchard," reported the Meyersdale Republican, where "the evening was spent in feasting and playing games." Ella suffered a fractured nose and broken teeth, a chest injury and many bruises and cuts in a December 1952 automobile collision with a vehicle driven by a relative, C.R. Cupp. Suffering from heart disease and hardening of the arteries, Olive was admitted to Somerset Community Hospital. There, she died on Jan. 26, 1961, at the age of 62. Clark survived his wife by a dozen years. He passed away in 1973. They rest together in the International Order of Odd Fellows Cemetery in Rockwood. A photograph of Olive, Clark and their daughter Ellouise was printed in the January 1993 edition of the modern version of the Younkin Family News Bulletin. Daughter Ellouise Theo Younkin (1921-2009) was born on Nov. 14, 1921 in or near Rockwood. She married James Kreger ( ? - ? ) and had two children -- Nancy Jo Brown and Thomas C. Kreger. Circa 1952, the family made their home in Connellsville, Fayette County. James was employed over the years as a welder with Freuhauf Independent Metals in Uniontown, Fayette County. Said the Somerset Daily American, Ellouise "worked as a secretary/bookkeeper for Rockwood Insurance for 10 years and later for the Somerset County Recorder of Deeds where she retired in 1980." Eventually, she and her husband divorced. She attended the national Junghen-Younkin Reunion in Kingwood, Somerset County in 1992, where she met the founder of this website and provided vital information about this branch of the family. Ellouise passed away at the age of 87 on March 15, 2009, at Memorial Medical Center in nearby Johnstown, Cambria County, PA. She was laid to rest near generations of ancestors at the Rockwood IOOF Cemetery. Granddaughter Nancy Jo Kreger was featured in a January 1970 edition of the Meyersdale Republican for her candidacy as Rockwood Maple Queen. She married Craig R. Brown. In 2009, their home was in Charleston, SC. Grandson Thomas Clark Kreger (1959- ? ) was born in about 1959. He has dwelled in Somerset. Daughter Grace Hauger (1904-1983) was born in 1904. She is pictured in the book, Down the Road of Our Past, Book II, published by the Rockwood Area Historical & Genealogical Society. Her husband, William Franklin Eagle (1900-1997), was a coal miner in Rockwood. The couple did not reproduce. Over the years, Bill worked in the coal mines, drove a bread truck, and in a local printing shop. He was Sunday School superintendent at the Rockwood Church of the Brethren for 12 years, trustee for 20 years and a deacon for 35-plus years. Said the Daily American, "He rarely does anything but work, reflecting a lifetime of steady employment that began when he was a motorman in the coal mines for 18 years." Among their possessions was an original photograph taken at the first Minerd Reunion at Ohiopyle in 1913. He was featured in a Somerset Daily American article, “Bill’s a Working Man,” on his 80th birthday. Grace passed away in 1983. Bill outlived her by 14 years. He died in 1997. Daughter Edna Hauger (1908-1992) was born in 1908. She married Maynard Sembower (1908-2009), the son of William Francis and Grace (Boyer) Sembower of Markleton, Somerset County. The couple produced one known daughter, Carol Ann Sembower. A registered nurse, Edna graduated from Conemaugh Valley Memorial Hospital in 1932, at the age of 24, and went on to become a private duty nurse at Somerset Community Hospital for many years. She also was a charter member and officer with the Ladies Rebekah Lodge No. 256 in Rockwood, which was launched on Nov. 20, 1940. Circa 1957, she held the office of "R.S. to N.G." Maynard was employed at the Snyder Bakery in Rockwood for many years, and later worked for the Pennsylvania Game Commission, from which he retired in 1973. Active in the community, he was a fireman and treasurer of the Rockwood Fire Department and a member of the Central Pennsylvania Police Officials Association of Johnstown. He also was a member of the Black Township School Board for many years in the 1940s and ‘50s. Maynard is pictured with fellow bakery employees in the booklet Rockwood Centennial: 1857-1957. Employees of Snyder Bakery, Rockwood. Maynard stands 9th from left. In 1983, they were featured in the Daily American on their 50th wedding anniversary. Sadly, Edna died in 1992 at the age of 84. Maynard outlived her by a remarkable 17 years. Said the Daily American, "He spent much of his time doing volunteer work on the Great Allegheny Passage trail since its opening in 1993... He enjoyed spending his winters at Sugar Creek Estates in Bradenton, Fla., with his daughter and son-in-law." Maynard passed away at the age of 100 at Somerset's Hospice House on Sept. 16, 2009. He was laid to rest beside his wife at the Rockwood Odd Fellows Cemetery. Pittsburgh Post-Gazette biking columnist Larry Walsh wrote a feature obituary about Maynard in its edition of Sept. 19, 2009. Walsh described how Maynard sold thousands of dollars worth of shirts, ballcaps and pins to raise money for the Great Allegheny Passage. In his memory, the parking lot at the Rockwood trailhead was named in his memory, and he is painted into a mural on the side of the Clapper Building Materials building, wearing an engineer's cap and overalls. Daughter Carol Ann Sembower ( ? - ? ) was born in (?). She attended the Johnstown Memorial Hospital School of Nursing circa 1958. She married Roger Romesburg. Circa 2009, they resided in Bradenton, FL.